Mr. Peter Schnyder, General Manager and Mr. Stefan Frenzel, Executive Chef of The Imperial Mae Ping Hotel, recently gave a warm welcome to the popular Serbian cooking TV show, Gastronomad. One of the most popular shows on Serbian television, the team visited the Imperial Mae Ping and filmed the chef there. The cooking/travel show will record a series of 15 episodes about Thai food in Thailand. 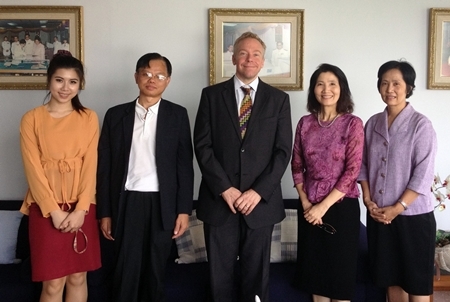 David Hodge, Public Affairs Counselor, Acting Consul General (center) met with CMU Library Director Ms. Wararak Pattanakietpongse and new American Corner Director Mr. Nopporn Phianphikul, and the American Corner Team to hear the updates on the American Corner Chiang Mai’s plan for the next fiscal year of 2014. Stay tuned for upcoming activities, including a Social Etiquette Workshop! (Photo courtesy of U.S. Consulate General of Chiang Mai). 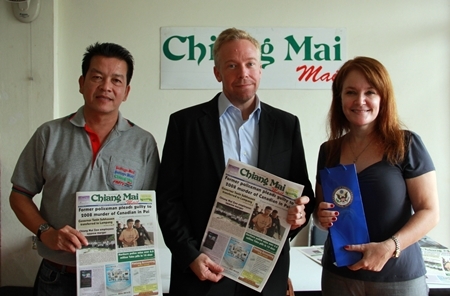 David Hodge, Public Affairs Counselor, Acting Consul General for the U.S. Consulate-General Chiang Mai paid a visit to the Chiang Mai Mail offices and chatted with Editor Nopniwat Krailerg and Managing Editor Shana Kongmun about the expat population in Chiang Mai. 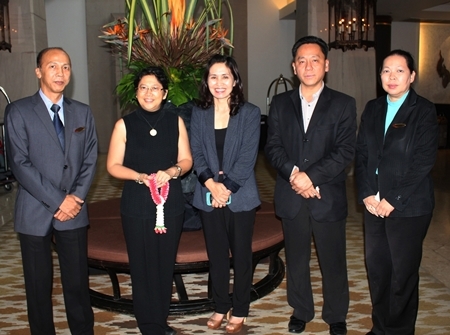 He then presented the editors with a bottle of wine from Washington State in the U.S.
Mrs. Nongluk Chaithep Director of Sales & Marketing of The Imperial Mae Ping Hotel recently welcomed Mrs. Jocelyn S. Batoon-Garcia, Ambassador of the Republic of the Philippines; she recently stayed at The Imperial Mae Ping Hotel for a Philippine Embassy consular outreach in Chiang Mai. 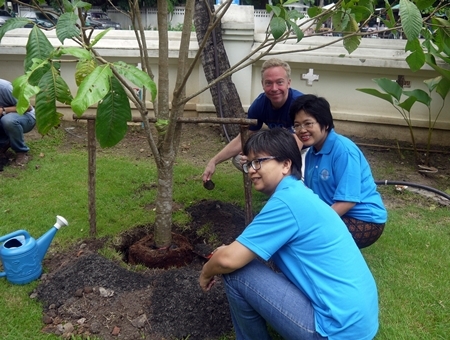 Acting U.S. Consul General David Hodge plants a tree with Suwaree Wongkongkaew and Woranan Bunasurak at the Chiang Mai Historical Museum behind the Arts and Culture Center on Saturday, August 31, 2013 as part of the 180th anniversary of Thai U.S. relations celebrations. Students joined in planting 180 trees around the city.